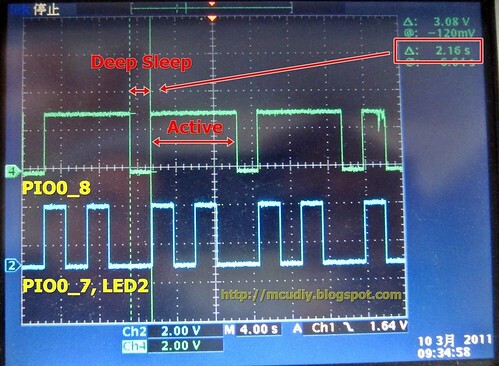 自動喚醒的概念是 LPC1114進入Deep Sleep Mode前先將main clock選為wdt clock,並設定16bit timer0 的match0 內部設定對應IO(PIO0_8). 進入Deep Sleep Mode後等timer(由WDT clk供應)時間到 PIO0_8為High,觸發wakeup中斷.進入WAKEUP_IRQHandler而喚醒MCU進入active mode. PIO0_8 High時候表示為MCU為Active Mode. 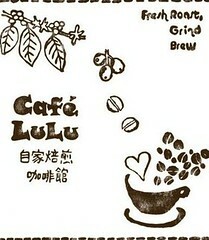 轉為Low的時候就進入Deep Sleep Mode. 再轉為High時則為Timer0 match0 進而trigger wakeup interrupt. 接著藍色波形 PIO0_7 變為High 由 WAKEUP_IRQHandler 內控制LED2進行High->Low->High->Low. 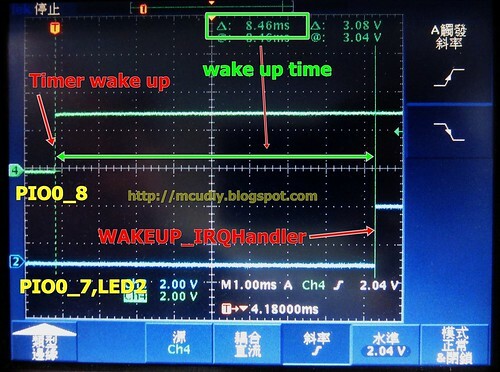 離開WAKEUP_IRQHandler,接著maim中的while loop執行,進入Deep Sleep Mode設定. 示波器trigger PIO0_8 rising edge可觀察到 Timer0 match0 high至WAKEUP_IRQHandler中第一次將PIO0_7為HIGH(LED2 ON).以量測喚醒至執行程式所需花的時間.